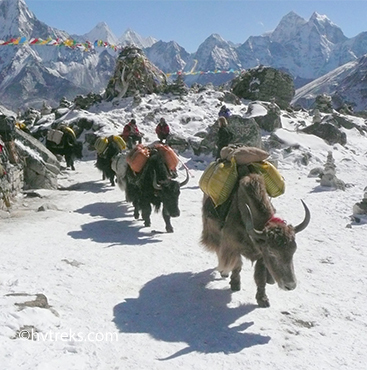 This famous trek to the Everest Base Camp is much the grand walk in the land of the Himalaya. 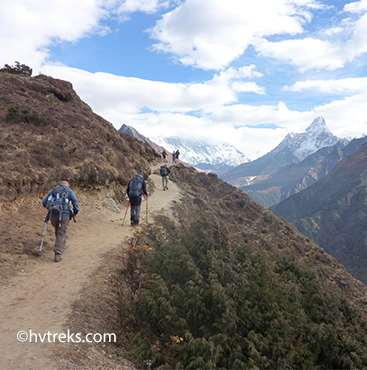 The trail to Everest winds through Nepal’s famous Khumbu Valley which is surrounded by five peaks over 8,000 meters. The Khumbu Valley is a globally unparalleled, awesome, awesome experience! Everest, or Sagarmatha as it is known to the Nepalis, and the Khumbu Valley are housed in Nepal’s Sagarmatha National Park. Here beside Everest are Cho Oyu (8201m), Makalu (8463m), Lhotse (8516 m), Lhotse Shar (8400m). Not only does this trek give intimate proximity to the world’s highest mountain, but the area is home to the renowned Sherpa peoples. Their stoned-walled, sturdy villages amid Yak pastures sit anchored by colorful, still active Tibetan Buddhist Monasteries. The walk to Everest is as well a walk through the sacred, ancient culture of Tibetan/Nepali peoples. Namche Bazaar is the central village of the region, providing comfortable guest houses and amenities. It has been the launching place of all the great Everest climbing expeditions. In the season it is busy with expedition pack animals: Yak with dual large bundles, their bells chiming as they trod, and with horses and mules. Here too, the Yeti or Big-Foots, are still talked of, old-timers tell of seeing them in the mountains. We are going to have an exciting and adventurous flight from Kathmandu to Lukla today. We can compare this flight with the Moutain Flight. The flight is supposed to be exciting due to the climatic conditions; especially visibility and wind that affect our flight most may cause to delay. In a little turboprop with the capacity of about 14 passengers, we fly in the altitude up to 3500 meters to Lukla. If the day is clear we are lucky to view in the north the ranges of snow peaks of the huge mountains bordering with Tibet. And to the south, we can view the beautiful small villages and terraces of the fertile lands. After landing in Lukla, we walk downhill up to Chheplung then we walk uphill along the Dudhkoshi River to Phakding. Wooden and suspension bridges in the several points welcome us to cross the river. We rest in Phakding this day. From today onwards, after the dinner or before we go to bed, the Himalayan Vacation Treks and Expedition trekking guide will take a report and give a briefing in every evening about the trek that we are going to make next day. The path goes uphill and downhill to Namche Bazar. We reach Monjo, a village which is the entrance of the Sagarmatha National Park too. This point is a very popular place so the trekkers don’t miss the chance to take some pictures over here. This is the point where our permit and TIMS cards are checked. Then we walk downhill to Dudh Khosi. We walk along the Dudh Koshi crossing wooden and suspension bridges in several points. After we cross Larja Bridge over Dudh Koshi River, we can view the panoramic glance of Mt. Everest in about one and half an hour’s walk. We head to Namche Bazar, the very famous village in the Everest Region. We can hire horse if wish/needs at this point. We have a camp here. Especially the Friday and Saturday markets are very famous here. People from far and near come to make their business. Various things (local and imported) are displayed for sale. Especially people from Khumbu area (upper Namche Bazaar) come for shopping here on those market days. Since we are in the Everest Region Trek, we can view the Mt Everest almost from everywhere. We rest in Namche Bazaar today, especially for the acclimatization. The tribes living in Namche Bazaar are the Sherpas in a majority. We can experience somehow the lifestyle of Sherpas who has a closed culture with the Tibetan. We can visit the museum about the Himalayan people. This is the place with army camp, health post, school, police check post, bakeries, internet cafes, discos, bars, snooker, pool, foreign money exchanger etc. We can have a taste of local wine, alcohol, food etc. Number of shops and lodges welcome the tourists over here. Many trekkers stay here at least one or for several days for acclimatization. Especially the Friday and Saturday markets are very famous here. People from far and near come to make their business. Various things (local and imported) are displayed for sale. Especially people from Khumbu area (upper Namche Bazzar) come for shopping here on those market days. Himalayan Vacation Treks and Expedition guide will arrange for our visit to the various places today. The path goes slowly uphill in the beginning. We walk through almost barren lands; just a few small bushes in some places. 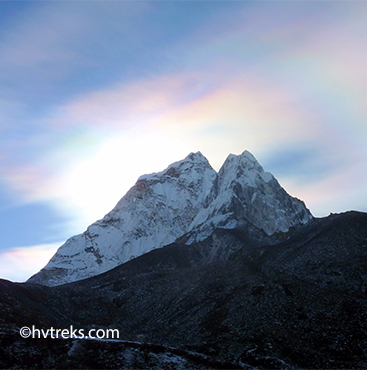 We can have a view of Ama Dablam, Lhotse Shar, Taboche, Kangtaiga and Thamsherku on the way. Then we walk downhill to the Phungi Thanga Khola. We cross the suspension bridge and walk uphill to Tangboche. We can visit to Monastery in Tangboche which is the biggest monastery of Khumbu region. A big water driven prayer wheel (Maane) is the matter of attraction in Tengboche. An army barrack is also set up here. Internet service is available in this campsite. We can use a telephone, mobile overhere. We walk downhill in the beginning until we Deboche. Then the path goes flat along the Imja Khola, a stream originated from a glacier. We have to cross the same stream in several places through the wooden and suspension bridges. We see some jungles too in some places on the way. In Pangboche we visit a monastery where the skull and bones of a hand of a yeti had been kept previously, this is what Lamas in the monastery and people in the village talk. But these have been already stolen by the smugglers so they are unfortunately no longer visible. The peaks of Ama Dablam, Thamserku, Lhotse, Nuptse, Lobuche Peak, Pumori and many other peaks give us the feeling that we are walking in the area among the highest peaks of the world. We may see blue sheep also in this part of our trek. Dingboche which is the highest permanently inhabited place in the world is located at the altitude of 4400 meters. Feriche lies just opposite to Dingboche just 50 minutes walk from Dingboche. We can go to Feriche if any health problems occur while walking. It’s a rest day today specially for acclimatization. So we can stay in one place and look around or we can visit to Chuking and come back. This day we find out about the dangers of altitude sickness by the doctor of the Himalayan Rescue Association team from Pheriche. In Chukung which is the last village in this valley, we can have lunch. From here we have a wonderful view of the Lothse, Makalu, Island Peak and Amphulaptcha-La, Ama Dablam Parchamo and the Tashi-Labtsa. After lunch at Chukung, we walk back to Dingboche. Today we begin our trek from the route that goes to Everest Base Camp. The trail to Gorak Shep goes ahead through the lateral moraine of the Khumbu Glacier. We pass through the pyramid sign post. Ahead on the trail we see the crest of the north ridge of Everest along with Mt. Pumori, Mt. Mahalangur, Mt. Lingtern, Mt. Khumbutse, Mt. Nuptse, etc. Climbing steeply up to the top through the torrent of Changri Glacier, we catch our first glimpse of Kala Patthar, a grey-green knoll beneath the Mt. Pumori. As we reach Gorak Shep, we will find snow-capped mountains looming all around us including the top of the world – Mt. Everest. Gorakh Shep is the highest campsite of this trek. So we trek slowly. Very big rocks are seen on the path since we are in the lap of Himalaya. Gorak shep has internet and telephone facilities. This is the last site with the hotel facilities. 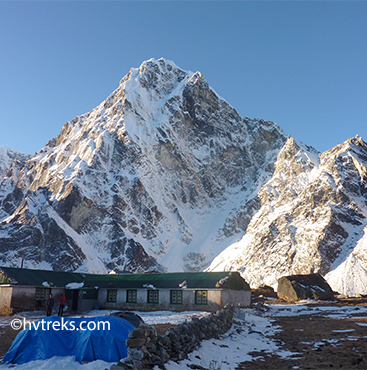 There are only 3 hotels for the trekkers to spend the night in Gorak Shep. After breakfast, we take the trail to Everest Base Camp through the once vast Gorak Shep Lake. Continuing straight ahead, we come through the Indian army mountaineers’ memorials. Only upon reaching the Everest Base Camp we really appreciate the Everest climbers who braved the perilous route through the Khumbu icefall. We can view Nuptse, Khumbuste and Pumori mountains from the base camp. Everest actually is not visible from here. By now we have met the ultimate objective of our trip. Day 12: Gorak Shep – Kala Patthar (5550m)- Pheriche (4240 m)7-8 hoursToday is the day we walk to the highest point of our trip. We begin early in the morning to catch the spectacular views from Kala Patthar and witness the first light of day touch the peaks of the highest mountains, particularly, Mt. Everest. However, we need to be prepared for an early morning departure is in spite of severe cold weather. Further, there is always the potential for chilly winds which are quite common. Familiar peaks such as Lingtren, Khumbutse, Changtse tower to the east even as Everest begins to reveal itself. While climbing to Kala Patthar, we can have a break to catch a breath at several outstanding view points from where we can snap great pictures. After several hours of ascent, we reach Kala Patthar. 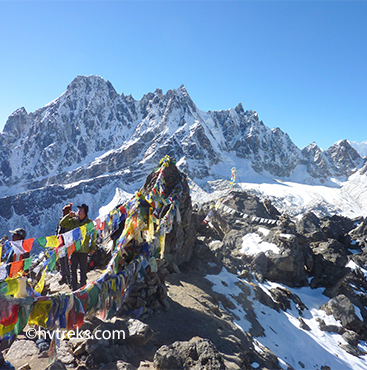 From kala Patthar, we rush up to the top of a rocky outcrop marked by cairns and prayer flags. Mind-blowing Himalayan panorama unfolds before our eyes as they wander from one mighty massif to another. On being back to Gorak Shep, we have breakfast and trek to Pheriche. In the beginning, we walk the same path back upto Thukla that we walked previously. Then from Thukla, we go downhill to Pheriche crossing Phulaji Kala. At Pheriche, there is a clinic run by Tokyo Medical University. Telephone and internet service is available. Just after the start of our trek, we walk through the path in a big plain area. We cross a stream that emerges from the Chola Glacier and Khumba Glacier and named as Khumbu Khola (stream). Following the main Everest trail down the beautifully scenic valley, we pass through the villages of Orsho, Somare and reach Pangboche. We cross the bridge over Imja Khola and walk down to Deboche village and climb for an hour to Tengboche . We spend a short time at Tengboche monastery; observe its many prayer wheels. 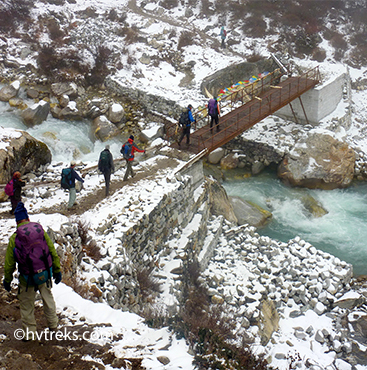 From Tengboche, a steep down to the first bridge over Dudh Koshi on our return trip at PhurkeTenga. Further, we pass the village of Tashinga and reach Sanasa. We spend the night at Sanasa. 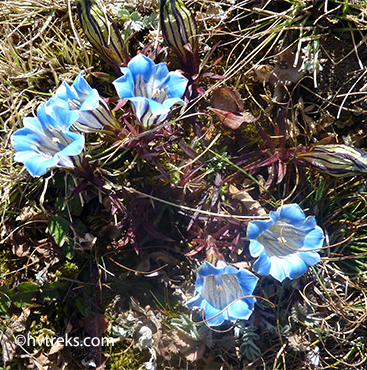 The path to Namche Bazar goes flat in the beginning then hangs to the steep slope winding through several bends. We cross Kyangjuma on the way. We have enough time in Namche to shop and relax in a bakery that serves coffee and cakes, and provides Internet access. A steep descent from Namche Hill leads to the suspension bridge crossing the Dudh Kosi River near the confluence of the Dhudh Koshi and the Bhote Koshi Rivers. We lookout for wildlife such as mountain goats, snow leopards, and colourful pheasants while passing through the forest by the trail. We cross the Dudh Koshi River twice at separate locations before reaching Monjo. We are out of the Sagarmatha National Park at Jorsalle with security check post. After exiting from its official entrance near Monjo and finally reach Phakding Village.Phakding is a quieter place to stay than Namche where we stay overnight today and we will have a less strenuous walk back to Lukla tomorrow. We walk downhill to Dudhkoshi River in the beginning then the path goes along the river almost for the whole trek today. We cross several wooden bridges over the small streams that finally go to Dudh Koshi. We cross Dudh Koshi River in every now and then through the suspension bridge. On the way, we meet several mani walls, prayer wheels, prayer flags and stupas since we are trekking in the Buddhist area. From the place called Thado Koshigaon, we can have the beautiful view of the peak called Kusum Khangkaru (6367m). Now, from Chauri Kharka the path goes uphill to Lukla. Since Lukla is a small city in the mountain region there is a facility of the bank too. A small hydro power station supplies electricity for the whole city here. Telephone, mobile and internet services are available here. Also, the bakery and café are here to enjoy western meals. Since our trekking is over today, we can have a party here. Every Thursday the local people around Lukla gather here for the weekly fair for their marketing/business and get together. Today we wait for the plane to fly Kathmandu. Who knows, we will come back to this region again or not in our life. So we may have look around for the last view of the Everest region. The flight depends on the weather condition. Flight delay or cancellation for the day is a common phenomenon in this region. So, we may have to pay extra charge USD 250-350 for the plane charter so that we will not miss our flight to our home country from Kathmandu.